A Home Grown Journal: Baby, It's Cold Outside! I know some of you have it colder than we do, and also many of you have it warmer (! ), but I wanted to report our thermometer reading first thing this morning was 25.2 degrees (Fahrenheit) below zero. So far, no wind and isn't that a blessing! A very frigid week ahead is forecast for us. As Papa Pea said this morning, "Maybe some of those terrible ticks will actually be killed off this year." If only. The reason given for the influx of ticks in our area has been attributed to our recent too-warm winters that have enabled them to "hibernate" and thrive when they were never able to do so in years past. Worry thee not about us. We're staying warm and cozy (well, maybe except for necessary short forays out into the elements) and the poultry seems to be surviving without any real problems. I do wonder how the local wildlife manages to keep functioning during these times though. Now I'm going to go turn on the oven to preheat while I put together a couple of pies as dessert for hungry folk who will be around our table tonight. Cooking and baking this time of year certainly is different than in the summer when I hesitate turning on the oven for anything! P.S. Papa Pea came in from morning chores a short while ago to excitedly say he had just experienced having a very large, healthy-looking, timber wolf come within 20 feet of him! Mr. Wolf was loping along, seeming to have an important destination in mind this frosty morning, when he looked up to see a heavily clad human standing nearby at which point he (the wolf, not the human) veered off toward our back wood working area and then up into the dense woods. What a sight! P.P.S. Chicken Mama just stopped by and her dad showed her the wolf prints. Since she suggested I take a picture to add to this blog post and she was dressed for outdoors, I coerced her into going out to take the picture. They are a good 4-1/2 to 5" long. The above picture doesn't do the size justice. Take out a ruler and look at how big that actually is. He was a big one! Again!!!! You win the Weather Sweepstakes, in Blog Land!!!!! YIKES!!!!!!! What we get, is so piddling, compared to you! TICKS! I know, you aren't supposed to use CAPS. But how else can I show my fear of them? And yes, I've heard, they are not killed by winter. But seems, yours will be. Yesssss!!!!! Baking and cooking, sounds like the perfect plan, for such a day. Especially when you know, hungry folks will be around your table tonight. How much more Hygge, can you get????? Jenn - The weather forecast says we're to get 3-6" of snow overnight and into tomorrow morning. But wait. I thought it couldn't snow when the temp was so low?? Oh, well. More insulation! wisps of words - Oh, if it could/would be true that this mid-winter deep freeze would actually deplete the tick population! I, too, am so afraid of them. We have such a heavy deer population that carries the dreaded deer tick that I don't know how we'll get rid of them. Except for winter weather going back to as cold as it used to be in days gone by. But then our summers were colder and shorter, too, so you can imagine what it would do to our gardens. Drat. Mama Pea, you weather is about to hit us hard this coming week. I'm not looking forward to it either. They said it would be bad. Kristina - Especially since you don't have enough snow cover on the ground! I know you'll be as prepared as you can be though. Do all you can to stay inside and stay warm! Cold here in NY too. I just took some cornbread muffins out of the oven to go with chili for supper. When I got up this morning and looked out the window I immediately noticed coyote tracks right under the window. I don't know what he was tracking because there were no other tracks in the lawn, but he made a big loop around the back yard. straight to the house, doubled back at the corner and ran right under the bedroom window, and out the driveway. Funny to think that while we slept, the coyotes were circling the house ! LOL! And CLOSE too. SmartAlex - Don't you have to wonder what all we miss when we're sound asleep at night? We were fortunate to know a couple of the children (then adults in their 80s) whose family originally homesteaded the 80 acres we first lived on when we moved up here to Minnesota. They told tales of moving onto the property in the early 1900's and living in a one-room log cabin before they built their house. They said in the winter time, 5-6 timber wolves would sit surrounding the log cabin and howl. They thought it was the light from within that attracted them. How spooky would that be? That's a little too cold for anyone.Thank goodness your warm inside. The pies sound good. Always great to have company to share them with! That wolf would be a little to close for company for me. Didn't realize they came that close to people. Glad we don't have them here! It does seem really cold for the hens. Tough little devils! Papa Pea thinks that wolf was just so intent on where he was going for whatever reason that he just wasn't aware of his surroundings. That truly must have been the case because the wolf almost came to a sliding stop when he spotted my husband standing there. A quick veer to the left and the wolf took a slightly different path! Good thing y'all are staying warm!!! It's cold, and I know your very thankful there's no wind right now. OMG....how wonderful Papa Pea was able to see the wolf. I'm also happy to hear the wolf was more afraid of seeing Papa Pea. Now that's one big _ _ _ wolf from looking at that footprint. Hugs, and love to you both. That's cold!!! We're having a weird almost early spring, which worries me. If things are coming up, trees sprouting, and we get a hard freeze that could be ugly. Stay warm! Sandy - I'm actually too warm right now. Had the oven on for Stuffed Green Peppers and lit the kerosene lamp on the table for atmosphere and heated things up too much. Not a bad problem to have in this frigid weather I suppose. Hugs. Nancy - I can't even imagine having spring weather now! It will be literally months for us beforfe we feel any of that. 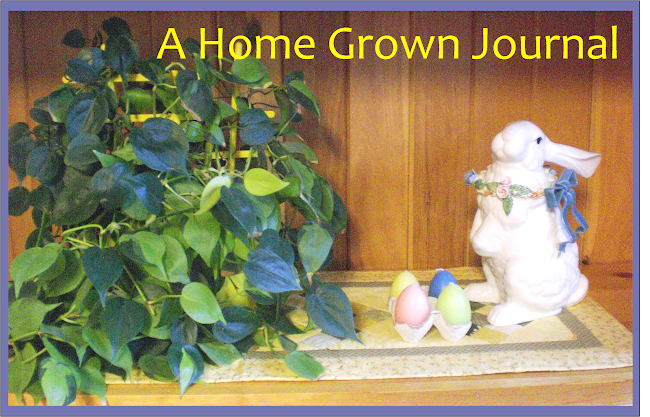 It's always a problem when things start to sprout and grow too, too early in the season. I would think you're bound to get more winter-like weather yet, won't you? Right now at 7:30 pm it's snowing here in Todd Co and blowing and drifting like a banshee. The wind is so damp out of the east. The saving grace is it's only -1, so if it can stay close to that, not too bad. I just dread the Tues forecast. 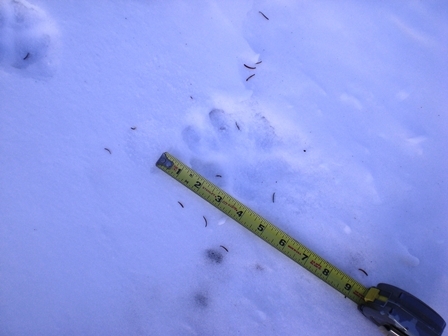 I don't think I've ever seen wolf tracks before, just coyotes here. Very cool to see a wolf! Phil - You're getting the snow that we were supposed to get! Not a flake over night here. Only about 5 below here which seems warm after the last couple of days! We have both coyotes (brush wolves) and timber wolves here. We see more coyotes than the bigger timber wolves, but it's always a thrill to see the big guys. Now that is one big paw print! But oh how exciting! Tonight, with the wind, we are going down to -50 celcius. They kept promising that all the way in to work this morning. Sigh. How exciting! A timber wolf that close! We have coyotes but I don't think wolves. I wouldn't mind, actually, since all my critters are safe (or so I hope). We have foxes and, while I haven't seen them, it is always interesting to follow their tracks in the morning. Oh, baby. -25F? I'd have to bundle up so completely, it's likely I wouldn't be able to move! Good thing I came back! There are 2 additions! Wow, a big wolf. Is this usual, such a sighting? Don't think I have ever seen such, in your blog, before. Mmmmmmm, doesn't this make you a wee bit worried? A big guy like this, zipping along, in an area which you humans regularly use? No. I suppose not.... Well, it would, me. You mentioned your Co-op. Someone else does also. And I'm wondering what these are..... Place to buy food, etc. But not at all, like the run of the mill super market. And I know I can do a search. But maybe you'll tell us about yours, some time. Stay warm you guys!!!!!!! But I know you will. Ticks can and live through most any weather. We have a lot of neophytes now with the wet ground cover. I removed one from myself a couple of weeks ago. I think the only thing that kills them is prevention such as Frontline and fire. Evil beasties they are. Those paw prints were huge, about a third bigger in size than our rottweiller girl, and she is a big dog! He must have looked quite something as he loped along. Wet here. Very wet. Windy as well. But mild, so no fires on in the house at the moment. All is muddy and the river is rising. Not to worry. It is as it is, at least all flying insects are kept in their hideaways and are not bothering us, which is a relief. Trying to keep looking on the good side to offset the misery which comes upon me when I have to walk through the mud, of which there is a lot at the moment! I woke just as the local news was going off so I am not sure what our feels like is but the temp is setting at 22 right now. Here in Nashville TN we live on a LINE and snow can go above us or below, seldom get any. MrsDM - Yep, we're really in the deep freeze this January! Schools closed here today and tomorrow because of the wind chills. Stay warm! Susan - Wolves have unfairly been given a bad name. There's never been a documented wolf attack on a human, but of course, they have taken family dogs who were tied out and/or unattended. It's always a thrill for us to see a big, healthy timber wolf. I know what you mean about wearing so many clothes that you fear of toppling over in a couple of feet of snow and not being able to get up. I've done it! wisps of words - Truth to tell, wolves are more wary of us than we are of them. We see coyotes much more often than timber wolves, probably because there are more of them. Neither animal hunts humans but they do prey on deer and will take livestock and pets if the opportunity arises. The "Co-op" store I speak of is currently a full-fledged grocery store pulling in huge sales. It started back in the '70s with a few families going together to purchase organically raised bulk foods at an economical price. For instance, we could purchase a 25 lb. bag of brown rice or case of coconut milk. The "store front" was one couple's front porch. It was so well received a very small space was soon rented in town and now after three or four moves and remodeling of buildings, it is housed in a large newly built building the size of a regular grocery store and carries a full line of any item you might want to purchase. It's a co-op because it's owned by its members who have input (through the board of directors - who are local members) into all aspects of its functioning. The items on the shelves are organically raised or as "naturally" raised as possible, there are no GMOs, etc. There are huge fresh produce, meat, cheese and frozen food sections. You don't have to be a member to shop there, but there are discounts for members. It's a blessing for folks like us in that we would otherwise have to go to the "big city" or order supplies online that we can't raise ourselves which would be much more expensive. Hope this give you an idea of what I mean when talking about our Co-op. Goatldi - Re the ticks . . . yep, folks have had them appear on their clothing in mid-winter. Ugh. Why do we have ticks anyway??? Whose idea were they? You had better believe we take any precautions we can when venturing out in the woods or high grasses in the spring, summer and fall. Double ugh. Vera - Ah yes, mud. I hate mud. After a snowy winter we always have a terrible mud season . . . otherwise known as spring around here. At which time I fervently wish all was covered with blacktop paving. (Not really. Why would we live in the woods if we wished for concrete sidewalks, driveways and roads?) Hoping your rains desist and your river doesn't rise anymore. Pam Jackson - 22 degrees in Nashville has got to feel cool, if not down right cold! Up until this past weekend, we here in northern Minnesota were the only ones to have snow on the ground. Now the central part of our big state has snow, too. Weirdly, there have been some recent winters when the snow has gone south of us . . . which doesn't make much sense at all. Wow, now I'm truly JEALOUS of your co-op!!! Michelle - I'm always amazed that we are so fortunate to have it in our small community. We still have the option of ordering those 25 lb. bags of rice or black beans or cases of tomato products (which you know I can't raise in the garden -- darn) or cases of ground beef by placing a special order. One whole section is bulk bins of all kinds of nuts, grains, dried peas, bean and legumes, spices, dried fruits, ground flours, granolas, etc. We even have organic ice cream in many flavors! Folks who visit from out of the area say it's one of the nicest co-ops they've ever been in. Lucky, lucky, lucky we are. And I so appreciate it! What a wolf experience, that is incredible. His track is awesome. I find winter such fun for baking. Just when we need to eat less because we aren’t doing as much, I pour the coal to the stove and bake like crazy. This year though, I am freezing a lot of things for summer. We are hoping the cold [relative to our area] stays a while, we too need tick killing weather. However our silly peach trees have all budded. We're getting a taste of you're winters for a couple of days! Thermometers around -20F with wind chills just above -40F. Every one is kind of looking out for each other and doing ok. Warmer in a few days. Lots of dog ticks here, but not many deer ticks (yet). We always hope for a cold stretch of winter to help beat back the ticks and other bugs, too. I can't say for sure if it actually works - at least for dog ticks - but we wait for the cold and hope for the best! A wolf!! Cool to see, but could be hard on the livestock. We have plenty of coyotes like some of the others, but no wolves that I've ever heard of. Must have been quite a sight to see that big boy that close! I must confess to being a little jealous! Fiona - I know what you mean. In the summer time when we're out actively moving around most of the day (sweating, grunting and groaning), we practically live on salads because that's what tastes good. What do we eat these days bundled up inside for much of the day? Carbohydrates, protein, and . . . oh yeah, those yummy desserts we seem to crave. Not fair, is it? Such a wise lady your are to be filling your freezer for the coming busy, busy summer time. That makes good eating so much easier when you're busy and don't have enough time in the kitchen. Oh, go cover up those peach tree buds. It's too early! Mark - Yes, so many parts of the Midwest are getting the way too cold weather as you are. You must be setting some kind of a record with your frigid temperatures. I think we would all like some good to come out of this cold snap . . . like freezing out all ticks! Wouldn't that be great?? How exciting! I've never seen one in person. Are they dangerous or is the old 'only if really hungry when you meet them' theory? I think that is really exciting. Nitty is a big dog and has huge paws but still only probably 3 inches....that's amazing how big those animals are....especially when you see them up close. Thanks for the picture of the paw print and the ruler for size. You made my day! Ticks here are awful and I got a couple in Iowa but nothing like down here. I do think it's the freezing that keeps them at bay but here not even the weeds freeze. Same reason we have termites here and tarantulas and scorpions. The tarantulas and scorpions are small ones at least. I'll take the timber wolf!